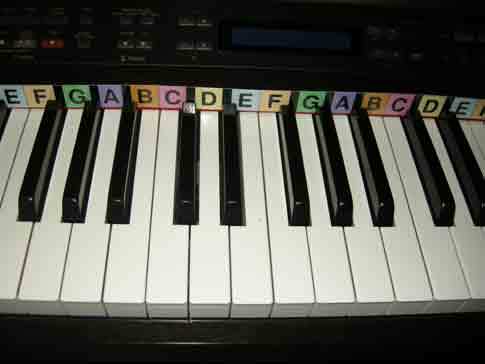 I have found many different programs that use color to help teach music reading to children, especially on the piano. Piano Wizard, and Piano for Preschoolers come to mind, but there are many others. Some have even used color to teach singing and perfect pitch, such as the Taneda method. I think that using color is a good idea, and I experimented with it with some of my beginning students who were struggling to read music. I created my own color code and created a piano chart for my students. Then as either a theory assignment or as part of our lesson, I would have my students color the notes the appropriate colors. For example, they would color all of the Cs pink, and all of the Gs green. Because my students were the ones to color the notes, this reinforced the note-reading for them. One of my students told me that she loved how pretty her book looked after she colored the notes. 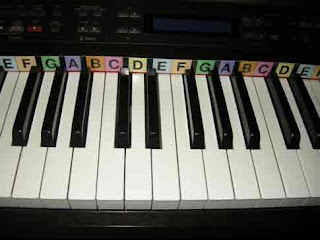 In this manner, color coding can be compatible with any piano method. Here are the piano charts that I made for my students. I recommend printing on cardstock, laminating if desired, then cutting them out and taping them together to make a strip that can be slid behind the keys. The term Colorcode was invented by colorcode music in 1993 to develop the finest line of guitar learning software, Colorcoded notations and the CMX system for guitar and piano players. Then somebody decides to steal the copyrighted name and make his on line. Visit: www.colorcodemusic.com and read the all rights reserved legal claim. For piano chords, all in 2 pages and very easy to understand. Who needs a wheel? Wish you have your favorite song. Thank you!